LC 2015 - Which Cooling Unit Do I Need? For each cooling unit, you also have a choice of fresh air intake—that is, where the cooling unit draws its airflow from: rear or top. Don't let these options confuse you. Go directly to our wine cooling unit sizing table or read below for guidance to select the right cooling unit to protect your wine collection. The cooling unit you need typically depends on the cabinet model you intend to purchase. If you plan on buying one of our credenzas, 1400, or 2400 cabinets, our 1800QTL is the best choice, assuming that the cabinet will be located in a temperature-controlled environment. For our larger 3800 and 5200 cabinets, we recommend our 1800QT. However, if noise is a primary concern, our 1800QTL will work provided it is located in an environment where the temperature doesn't exceed 75°F and/or the desired storage temperature is 58°F or higher. We suggest our 1800XT cooling unit for garage installations (the most common environment for our Vault 3100 cabinet) as long as the garage temperature ranges from 50° to 95°F. We also recommend our 1800XT for commercial applications, including restaurants, and ducted applications. Once you’ve selected the right unit using this simplified method, you can skip to step 7 below for an explanation of intake and exhaust types. The cabinet-to-unit matches outlined above are based on certain assumptions which may or may not be true for your circumstances. If you'd like to make a more precise, informed choice about your cooling unit, follow the 7 steps set out below. 1. Decide which size of cabinet you want. The size of your cabinet affects the amount of energy it takes to cool the space inside. You need a more powerful unit to control the temperature of a larger cabinet, one that can hold more bottles. Estimate how many bottles you'll need to store in your cabinet and go with the model that best suits that amount. Remember to err on the side of too much space, rather than too little, since your collection may grow over time. For instance, if you plan on storing 300 bottles, we suspect that you won't regret purchasing a 3800 model (which can fit up to 458 bottles) and giving yourself plenty of extra room, instead of a 2400, which holds 286 bottles. All wines—red and white—should be stored at temperatures ranging from 55° to 60°F. Please note that we're talking about storage temperatures, not serving temperatures. 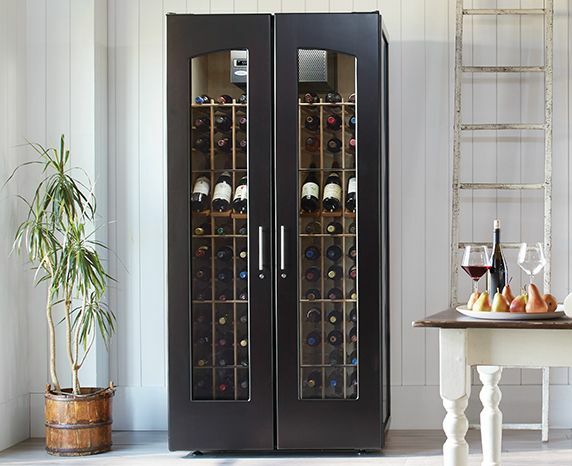 Our cabinets are designed to maintain ideal storage temperatures for your wine. If you want to store your wine at the colder end of the range (or below), you'll need more power, measured in British Thermal Units per Hours or BTUH, to maintain the colder temperature. If you are comfortable storing your wine at the warmer end of the range (our units can be set as high as 62°F), you'll need less cooling power. In other words, the colder the desired temperature, the more powerful the cooling unit required. 3. Find out the highest outside temperature your cabinet will be exposed to. 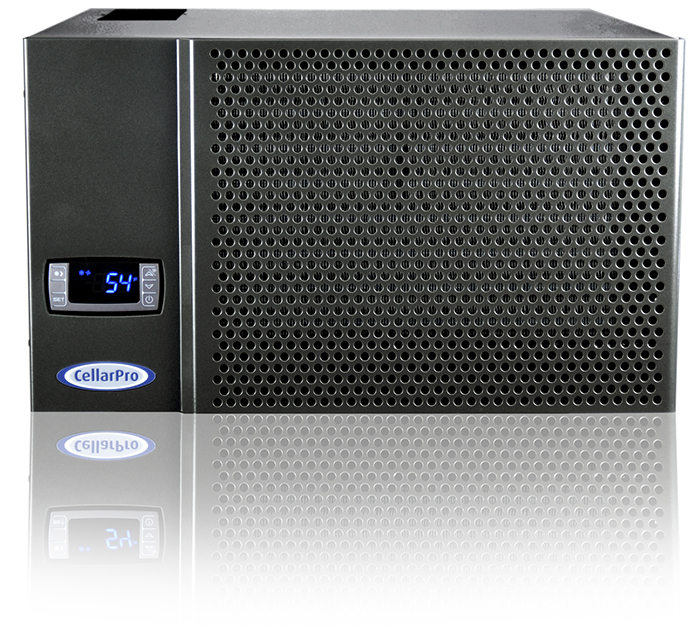 The hotter the environment around your Le Cache cabinet gets, the harder your CellarPro unit will need to work to keep your cabinet at the desired storage temperature. To pick a powerful enough unit, you need to know the peak ambient temperature, or the maximum temperature in the environment where you will place the cabinet. Even if the room where you plan to put your cabinet has a low average temperature, you should plan for the worst-case scenario in terms of heat. Does it ever get up to 70°F, 80°F, 90°F or even higher around the cabinet's intended location? If you don’t measure the temperature in that space, look up the highest temperatures in your region in recent years as a gauge. Temperature fluctuations inside a cabinet can disrupt the delicate biochemical aging process and damage the flavor and aroma of your wines. Just 24 hours of high heat or wavering temperatures can damage or even ruin your wine. By preparing for the most extreme conditions that your cabinet will encounter, even if those conditions are rare, you can protect your wine from the damaging effects of exposure to high temperatures. 4. Consult our buying guide charts to see which cooling unit model you need. First, you look at the table that corresponds most closely to your desired cabinet temperature: 55° or 60°. Then look for the number on the table at the intersection of the column for your chosen cabinet model and the row for your peak ambient temperature. Once you've found that box or cell, make a note of its color. Check the key at the top of the chart to see which cooling unit model that color represents, and that's the right model for your cabinet. For example, let's imagine that you plan to keep your wine at 60°F, want to buy a 3800 model cabinet, and your home's peak ambient temperature is 90°F. Look at the second chart on the page, the one that calculates cooling unit capacity at 60°F. Locate the column for the cabinet size you'd like to buy (3800), then see where it intersects with the row for your target storage temperature (90°F). The intersection is the cell outlined in blue. The number in that box (1229) is the thermal load of a Le Cache 3800 wine cabinet based on the assumptions provided. Therefore, in order to maintain 60°F inside the cabinet when temperatures reach 90°F in the ambient environment, you'd need to select a cooling unit that produces at least 1229 BTUH. We've listed the BTUH produced by each cooling unit at 55°F and 60°F at the top of the page. To make it easier for you, we've also color-coded each cell by which unit covers that thermal load. In this case, the cell is medium-gray, and matches the medium-gray at the top of the table that corresponds to 1800QT. 5. Consider the noise levels you'd be comfortable with. Where will you be placing your wine cabinet? If it will be located indoors in a quiet location, you'll want the quietest cooling unit that can do the job. Based on the cooling unit buying guide table, you may need the power of a larger cooling unit, but you may not want the noise associated with that power. In that case, consider whether you'd be comfortable storing your wine at a higher temperature. By increasing the storage temperature from 55— to 60—F inside the cabinet, you may be able to select a less powerful—but quieter—unit for your cabinet. Also, consider how often the peak temperature conditions will arise outside the cabinet. Are those peak temperatures rare? If so, looking at the cooling unit buying guide table, you maybe able to move to a higher row with a lower ambient temperature, which may result in a smaller, quieter unit as your selection. Just remember that the temperature inside the cellar may rise during those infrequent peak ambient temperature conditions. 6. Factor in how often you’ll access your cabinet. If the wine cabinet will be used in a commercial environment, like a restaurant, where the doors will be opened and closed frequently, you'll want a more powerful cooling unit. You should also consider purchasing our bottle probe (sold separately), which allows the cooling unit to run based on liquid temperatures. Without the probe, air temperatures which will change each time the doors are opened and closed and trigger the cooling unit to start and stop too frequently. 7. Choose top or rear venting, depending on where you plan on putting the cabinet. Now that you know which specific model of cooling unit your cabinet needs, you can decide between a top- or rear-vented unit. A top-vented unit lets you place the cabinet directly against a wall. This kind of unit requires 18" of clearance above the cabinet, or 12" if the cabinet has crown moldings. The space to the left and the right of the cabinet must be open; it can't be enclosed or placed against a side wall. The area above the cabinet allows the cooling unit's hot air exhaust to dissipate and provides room for fresh air to reach the unit so that it can cool down. It is critical that this space be large enough so that the cooling unit isn't forced to recycle its own hot exhaust. A rear-vented unit accommodates rooms with low ceilings, but you'll need space behind the cabinet. If you lack the 12" clearance space above the cabinet, a rear-vented unit requires just 4-5" of clearance behind the cabinet instead. Once again, the spaces on the left and the right sides of the cabinet must remain open and unblocked. Based on where you plan on putting your cabinet, choose the venting option that would be most convenient for your space. If you have any questions about selecting a cooling unit, feel free to call one of our expert representatives toll-free at 1.877.532.2243 or ask us through a live online chat. You can also use our contact form. We're glad to discuss your wine storage needs.